I like the mars monolith, very cool. Agreed, "they" should have put the same one on Phobos. Shklovsky stated Phobos was being "slowed by electromagnetic drag and tidal friction more than was possible was an actual solid moon." Excuse my ignorance; but does this suggest that there is some electricity running? (ie machines) What would be throwing out electromagnetic energy?? Another non-smarty pants here. I think it would be Mars magnetic field or remnants of it slowing the moon. Maybe it is a normal moon...but someone dropped a couple of high-tech tunneling machines on the surface and hollowed it out as a refuge in case of Planetary threat to the Planet herself....like our Earth moon has been worked on. 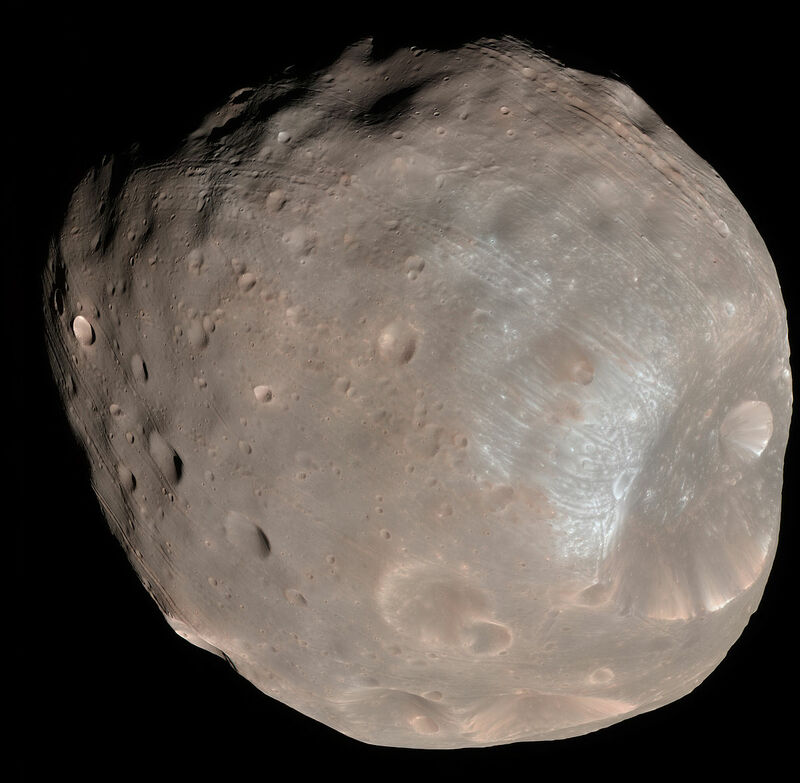 When wondering if Phobos is a "artificial" satellite of Mars, one should most likely take pause and ask themselves some questions of common sense. First, what does one mean by "artificial"? Does one mean an object that is completely built by an intelligence? Or does one mean something naturally made that has been modified by an intelligence? Okay, just looking at Phobos, I have a very hard time buying that it was something completely artificial that was constructed. Look at how it's completely covered in material and the impact craters. In order for some "artificial" object to become completely covered with material like that, it would need to of gathered dust from space for a long time....a VERY long time....as in about the same time as the solar system formed, say at least 4 billion years or so.....oh, and of course it would have needed to of been built about the same time that Mars formed.....yyyeeeeeahhhhh......sorry. Ain't buying that. Impact craters: Nah, sorry. Not buying that either. Getting hit with large objects at orbital speeds......would have blow some flimsy artificial station to hell and back. Okay....so what about "artificial" as in: "they towed in an asteroid and hollowed it out, made a station out of it." Ah! Now that is an interesting idea! We've thought along the same lines, except that we know it's a LOT cheaper to lift materials up from Earth and build something than it is to go all the way out to the asteroid belt and tow something into orbit, then hollow it out. Mars might be closer to the belt, but that still would have been a huge project for any Martian Civilization. Much easier to simply build stations in orbit from materials lifted up, at least at first. But okay, let's say they did that: Where is the gravity? What I mean is: you hollow out an asteroid, then spin it so you have artificial gravity on the inside. Free fall is great, so is micro gravity. But you're going to want whatever your normal gravity is for living conditions inside a hollowed out station. Phobos doesn't spin like that. In fact, it's tidally locked. If it had been spun up to induce artificial gravity, you also would have it far enough away from your planet so it doesn't become tidally locked again (have to waste a lot of energy spinning it back up, or maintaining that spin). Which brings us to the other question: how close it is to Mars. Phobos is so close to Mars that it orbits it in 8 hours. And it's getting closer and closer to Mars. In about 50 million years it will go BOOM. If you bothered to tow an asteroid all the way from the asteroid belt to make a station, you would not put it so close to your planet to where it's going to end up spiraling inward and get tidally locked. However, I will tell you what can do that: A asteroid that happened to pass close enough to Mars to be captured by it and become one of it's moons. But what about the weird things in the other photos? Well.......while I don't buy into the whole Martian Civilization idea, I will say maybe they did have one that at some point visited their moon and left stuff there. Maybe you're seeing probes or landed spacecraft. Personally I don't buy that either. If Mars ever did developed life in the past, I don't think it was around long enough to become intelligent before Mars began dying. OK, but what about that monolith? Is it a "trick of light and shadow" or what? Or it could be an actual Martian EVA backpack left there for all I know. Without higher resolution images it's impossible to tell. Of course nothing wrong with imagining "What if? ", that's always cool. Do you think the public gets grainy pics because the space agency puts low resolution cameras on board or is the res knocked down for public consumption? A lot of the probes have been launched decades ago , during that time the technology has impoved so a lot of the camera's might have less quality then your mobile phone cam does.